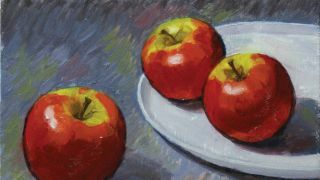 This tutorial guides you through an interpretation of Cézanne’s painting method from initial sketch to final flourish. Paul Cézanne was known for his experimental style, always pushing to expand the viewer’s experience of conventional subjects. Here, we’ll observe his painting technique, with blocky, stabby brushstrokes and muted notes that emphasise his eye for colour. We’ll try to recreate a painting with the feel of one of his works. Notice I don’t say “copy” – we want to be inspired by Cézanne, not slavishly knock out a version of one of his paintings. Brushstrokes are like handwriting. We all have our own individual marks and it’s important to recognise this and embrace it. I paint in oils because I love the freedom they offer, with long drying times and sculptural qualities. Portraiture is my main passion and I always like to add a bit of character to my still-life elements too. This gives them personality and informs the way I paint them. We’ll leave the composition simple so we can concentrate on technique. Feel free to add any still-life elements you wish, but I’d advise staying away from any objects with a very decorative finish. We’ll start off by setting up our scene and getting ourselves prepared. Then we’ll work our way through the painting step by step, breaking the process down into easy-to-manage chunks. Make sure everything you need is close to hand. A viewfinder can be fashioned from A4 paper and used to aid drawing and composition. I added marks to break the height and width into thirds. This can then be relayed to your panel if you feel less confident drawing accurately. Play with your objects and lighting to see what different effects you can create. Move elements around until you’re happy. First make a gesture drawing using charcoal. This is like a dress-rehearsal for your composition – it’s much easier to rub charcoal off than paint. This drawing should only be about the placement and general flow of objects, plus marking out any big divisions in tonal value. Keep your marks light and energetic. Once you’re happy you’ll be wiping it off, so get your composition working now. Now recreate your gesture drawing, but in oil paint. Use a dry-brush technique – take a little paint on your brush and wipe it a few times on kitchen towel, so it’s as dry as possible, and sketch your composition back in. Don’t just copy the charcoal lines; take this opportunity to remeasure and retune your drawing. Identify the main blocks of tonal value and colours again. Keep it simple, quick and full of life. It’s a good idea to premix as many colours as you think you’ll need before you start painting. You’ll obviously mix other colours as you go, but this is a good start. Hold a little of the colour on your palette knife up to the subject in place. You’ll get a better idea of accuracy under the correct lighting conditions. To keep colours brighter, mix together complementary colours around the colour wheel instead of automatically reaching for black or white. You can now apply colour. Using a dry brush with a scrubbing action (forefinger on top of the ferrule, with the end of the brush running under your wrist), work in the mid and dark tones. Squint, measure and adjust as you go. Keep it light and don’t worry about staying within your construction lines. You can see this technique in action in Cézanne’s unfinished Still Life With Water Jug (circa 1892-3). Tone is vital to a successful painting, and knowing how to manage it is an important skill to practise. My composition is mainly midtone with a secondary bias to light and just a small amount of dark. It creates a fun and relaxed feel to the painting, reinforcing the angle we chose to begin with. Use a tonal scale tool to identify the tones and make sure you’ve got the right balance for the effect you want. Next, reconstruct your construction lines and redefine the tonal areas. Remember to keep the lines light and energetic, and take the opportunity to remeasure and reassess your composition. Always be ready to change an element if it isn’t working. Its adaptability is one of oil paint’s most useful qualities. Don’t be afraid to wipe or scrape back and start again, if you need to. A scrunch of kitchen roll has saved many a painting from disaster! With fuller, more loaded brushstrokes, begin to apply your premixed colours, but be ready to adjust them as you go. Work in large shapes to begin with. At this stage things can sometimes seem a little clumpy. If your painting doesn’t immediately appear in front of you, trust the process. Keep squinting at your subject, stand back now and then, and keep your kitchen roll close at hand. Be open to change. Cézanne loved to create intricate patchworks of colour and balance them off with stabby, energetic brushstrokes. He often gave his still-lifes quite solid outlines, repeating the “reconstruction” phase later on in the painting. An outline defines a form so solidly that even a humble apple can stand out next to decorative jug or armless cherub. Have fun playing with your brushstrokes to see the effects. Work into the larger areas and add layers of detail as you go. Look for unusual colour details that pop out. Cézanne liked to make a feature of these, so run with them if you spot them. Strong colours will bleed out into their environment, and adding touches of complementary colours next to each other will help the colours sing. The last touches should be the highlights. This article was originally published in Paint & Draw magazine issue 1. Buy it here.